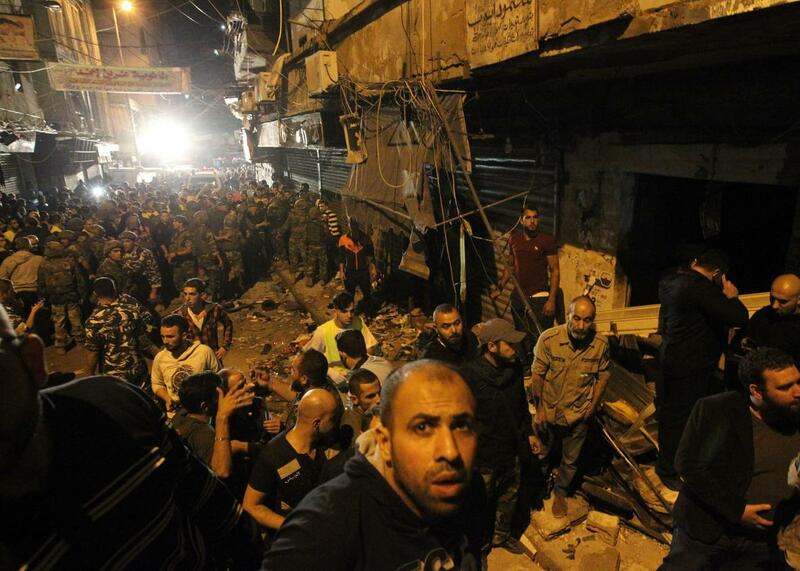 Dozens killed in bombing targeting Hezbollah stronghold in Lebanon. Emergency personnel gather at the site of a twin suicide bombing in Burj al-Barajneh, in the southern suburbs of the capital Beirut on Nov. 12, 2015. Twin suicide bombings killed at least 41 people and wounded more than 200 on a shopping street in a suburb of Beirut on Thursday. Burj al-Barajneh, a town south of the Lebanese capital, is a predominantly Shiite area and a stronghold of Hezbollah. It is bordered by a large and years-old Palestinian refugee camp. CNN reports that ISIS has claimed responsibility for the attack in a statement circulated online, but the authenticity of that claim has not yet been independently confirmed by authorities. Some areas around Beirut controlled by Hezbollah—an organization that backs Syrian President Bashar al-Assad—have been targeted in attacks by Sunni extremist groups since the beginning of the war in neighboring Syria. The worst such attack until now was a car bombing that killed 21 people in August 2013. The latest attack comes as Hezbollah fighters have joined with Syrian government troops in a new Russian-backed offensive to retake ground from largely Sunni rebel groups in northern Syria. The group is believed to have taken heavy casualties in the fight to save Assad’s regime. Last week, a motorcycle bomb killed six people in the border town of Arsal, home to a significant refugee population. The bombing targeted a meeting of Sunni clerics trying to negotiate the release of Lebanese security personnel held by jihadists in Syria. The Lebanese news website Now also reports that an IED and a suicide attack were foiled by security forces on Thursday in the northern city of Tripoli. It’s not clear whether there was any connection to the Beirut attack.